Some of you maybe familiar with Christalene Karaiskakis and the amazing Affirmation Board at Cape Saint Claire, but are you familiar with her other work? 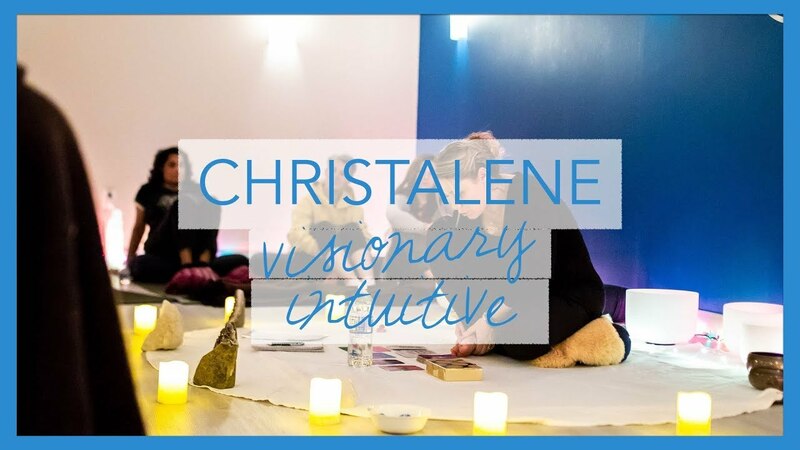 Christalene is a Visionary Intuitive that combines her passion for art with healing to fullfil her life’s purpose and we are so excited to feature her on this weeks episode of Around The Block In Annapolis! We hope you check out some of the amazing things she does in the community. Can you introduce yourself for those that aren’t familiar with your work? Hi there, my name’s Christalene. I am an Australian artist, a visionary intuitive, a mother, a wife, and an entrepreneur. What is a visionary intuitive? So a visionary intuitive says everything, and it says nothing. It’s just a gentle way of saying that I can help, perhaps, with some spiritual guidance, intuitive messages. It’s really subject to the person when they come to see me, what they’ll get in return. Can you tell us a about the Healing Through Body Art Project? The Healing Through Body Art project started when I was doing a Reiki healing on a client who had lost their nine-day-old child. As I was doing the healing, I received a download, a message, that I needed to start a project called Healing Through Body Art. That would mean that people, who for example, were going through cancer, and lost their hair, that I would adorn their crown and empower them through my art. Incorporating body art with healing, the two modalities that I feel a part of my life purpose. What inspired you to create The Affirmation Board at Cape St Claire? The Affirmation Board was created one day when a gentleman drove through the stop sign and nearly smashed into me and my family. Mama Bear came out. From that moment, I knew that something had to be done. So, I receive a message, from a higher power, God, whoever you may believe in, that I needed to do a sign and put it under the stop sign with an affirmation. Not only would people be encouraged to slow down and read the sign, they’ll be inspired for the day. When I first received this idea, I just went with the flow, not knowing the ripple effect it was going to have. There was a gentleman who was in front of my board and he was crying and I came out to see if he was okay, and I asked him and the affirmation for the day was: It’s not a bad life, it’s just a bad day. He had explained, that he was going through a divorce and he really needed to read something like that, just to motivate him, inspire him, and help him feel better. That was the moment that I realized that this is way bigger than me just writing an affirmation and that people are truly affected in a positive way. What types of events do you offer for the community? So I do a lot of workshops in the community, especially ones that are motivational, inspirational, and also, the best thing is, it gives people an opportunity. Perhaps they’re starting a spiritual journey and they don’t even know where to begin. So, perhaps, they’ll come to one of our workshops that I do with Scheri Goff. That’s once a month. She will do crystal quartz sound ball healings for 50 minutes, and then I’ll also give messages and people leave better than what they did when they came. It’s an opportunity for self-care, for them to self-reflect, and truly just to unwind from a very busy life. Other workshops I offer are vision board workshops to help people gain a better perspective of where they’re heading, what they want in their life. I’m really a big believer on focusing on, to be specific about what you want. Manifesting, it’s so important. And not only that, the best thing is that everyone’s capable of manifesting whatever it is that they want. They’ve just got to know what it is. And then watch it unfold. Have you seen the affirmation board at Cape Saint Claire? If you have, what is your favorite affirmation that you use to help you on those really tough days? If you haven’t seen the affirmation board, do you have a favorite affirmation? Let us now in the comments below! !